Treatment with Botulinum Toxin Type A injections to relax facial wrinkles blocks muscular nerve signals, which then weakens the muscle so it can’t contract. Wrinkle relaxing injections can be used to help smooth crow’s feet, forehead furrows, frown lines and skin bands on the neck. 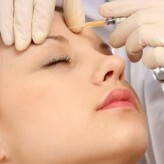 At Wellness Studio our Independent Nurse Prescriber is also able to offer facial rejuvenation and facial sculpting by administering Botulinum Toxin Type A (Nefertiti Facelift, Brow Lift, Mentails Treatment, Platysmal Bands, Gummy Smile, Smokers Fine Lines, Marionette Lines, Upper chest Treatment, etc). The effect may last up to 3-4 months or more in some cases and should be repeated to maintain the desired outcome. There is some mild swelling that will disappear after 30 minutes and rarely bruising to the injection site may occur.